After a disappointing week, I started losing motivation and hope again. Then I stumbled upon Mike’s IF blog. Mike’s blog The IF life focuses on intermittent fasting. Intermittent fasting is basically just taking “intermittent” times of fasting (no food) and working them into your lifestyle. This can be either daily or a couple times a week. He has a great ebook for only $5 which serves as a perfect starting point for IF newbies like myself. I have to admit, I wasn’t always a proponent of intermittent fasting. I did not even want to consider doing it; I found the concept kind of crazy to tell you the truth. I liked breakfast. I didn’t want to give up food! Especially with all the stuff I read about breakfast being the most important meal of the day and that we must eat 5-6 small meals per day in order to keep our metabolism up. Reading about these things gets persuasive after a while. I never actually doubted it the information I was getting fed by health magazines. I first learned about intermittent fasting from reading different diet books. The concept never appealed to me very much because the particular books I read promoted more extreme fasting: most books I read discussed 24+ hour fasts and just more intense fasting in general, which did not sound very fun. Two years ago, I purchased The Xtreme Fat Loss Diet and followed it for 3-4 weeks with hopes of losing the ~25 lbs it promises. The diet is very strict and specific. The diet layout is in a 5-day format and one of the days is a fast day where you don’t eat anything for over 24 hours (I think it was like 36 hours) except drink water, tea, and take a crapload of BCAA’s. I hated the fasting days. I seriously hated them. I remember by the end of the diet, I almost fainted in the grocery store on a fast day. It was scary. Ever since, I’ve been very reluctant to fast. Oh, and if you’re wondering – I didn’t lose very much weight. I gained it all back in the end. In his ebook, Mike discusses IF as something much more adaptable to a beginner like myself. He recommends an alternate day intermittent fasting technique where one day is an IF day, the next is a regular day, and the following is an IF day again, and so on. You adjust the schedule to your own liking. I really like the fact that you can be flexible and really just go along with how your body is feeling rather than going by numbers, times, and macros: being all strict about it. Being strict with numbers has never helped me before and I stopped counting calories when I realized I have a tendency to develop a chronic dieting mentality. When Mike mentions that the alternate day intermittent fasting is a great way to release yourself from the worries and obsessiveness around food thoughts, I was sold. It’s like Mike knew exactly what to say to convince me to try his beginner’s intermittent fasting program. Improved cognitive function and neural plasticity. Protect against some effects of Alzheimer’s and Parkinson’s diseases. Increased human growth hormone production. So here I am. Today is my first day of intermittent fasting. I am doing three IF days this week so I introduce the concept gradually into my life. I am doing the 16/8 window for the most part and also learning to eat more intuitively during my non-IF days. I’m hoping that this technique will help me free myself of my food obsession and allow me to lead a healthier lifestyle while also losing those pesky 15 lbs before summer hits. I do have to say that if I find this to be too stressful on myself and my body, I will not continue it. I do not want this to be a crash diet but rather, more like a new of living. When I think about it, there are many people I know that do intermittent fasting accidentally – there are tons of people I know who skip breakfast and don’t eat very late either. They are doing a form of intermittent fasting without even knowing it and they are healthy! If I find myself ravenous and thinking about food even more than before, you can bet your sweet asss, I will stop the IF life. I don’t want to say this on a negative note but I’m just being realistic. This is only a test so far. Let’s hope it is all it is hyped up to be! Oh and don’t worry, breakfast food is still my favorite and there will be no shortage of breakfast recipes coming up. Thankfully, I can eat breakfast at any time of the day 🙂 Told ya, I love my breakfast. I just don’t always have the appetite to eat it in the AM. Come on, I can’t say “No” this THIS! Anyway, wish me luck! I will continue with updates so you guys know exactly how my experience is going. This is as new to me as it is to some of you! What do you think? Tell me your experiences! Have you ever done intermittent fasting? Do you do it now? Did you start doing it with the alternate day IF program or did you just dive into it head first? 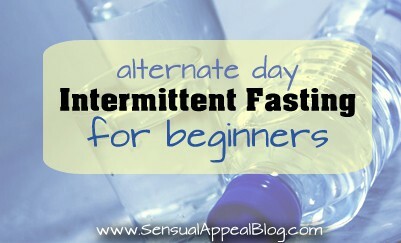 I haven’t heard of intermittent fasting before. What you said “sold” you (removing the obsessive food thoughts) is what would appeal to me. Calorie tracking can be so obsessive and it gets me into really bad habits. I will check out the links you posted and read up! That breakfast looks awesome. I wouldn’t be able to say no, either! Breakfast foods are the best! If I were fasting for a day I wouldn’t be able to do much activity – certainly not work out! I fasted for 12 days once many many years ago and lost 15 pounds which I quickly regained. This is not for me. Will be interested to hear how you do with it and how you are feeling. I’ve been IFing for about a month now and I love it! I’ve got my macros manipulated in such a way maintain my weight but gain muscle – which so far I’ve been doing successfully. I’m an ex-ED and I find that on IF I spend so much less time worrying about food because I’m only thinking about 2 meals a day and I restrictring meal sizes is never a problem (I’ve always liked my meals big). My sleeping has improved too; something that’s been out of whack for years. Thanks for the encouragement! I’ll be sure to let you know how it goes, so far so good! I like that the sleeping has improved for you too, I’ve had some problems with sleeping lately myself. Thanks for the comment! I’m not very good at skipping meals, but last month I did try having just two cups of bullet proof coffee in the mornings and working out and I would stay satiated anywhere around 1-3pm. I was quite impressed with myself! I stopped because I was having some health issues (not related to my fasting) so I’d be curious to see if I lost weight from it. Good luck with IF! I would love to hear how it goes! Wow you’re trying out ANOTHER fad…good luck with that. Well as I said, most people don’t see ad-IF as a fad, they lead it as a lifestyle. I’m hoping I can incorporate into my life similarly as well but as I said, time will tell if this is for me. I can’t know what works for me and what doesn’t if I don’t try it. I’m curious to see how if this actually works out for you. “Yeah I dont think its a good idea for anyone who has a job that requires to be on their feet a lot. I work in an office so it wasn’t that bad. I have been toying with the idea of fasting for a while, so I’m really interested in seeing how it goes for you! I don’t do it anymore, if you see my most recent post, I am going to focus on intutite eating and stopping with the diets and whatnot. I found myself losing a lot of strength after only 2 days of IF (not one after the other). I went to the gym after and I seriously could not lift even close to how I always could. So yeah.